Photos and article from WKTV news bulletin. 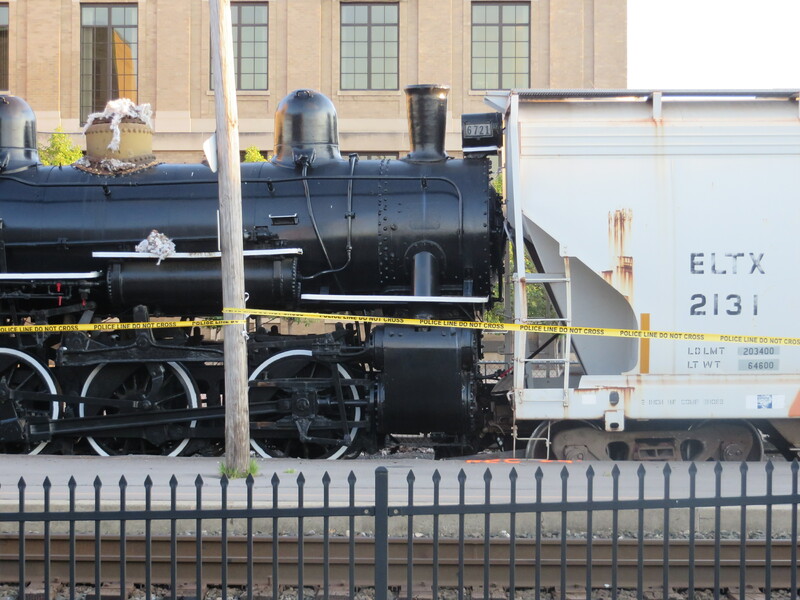 Officials are investigating whether a parked rail car was tampered with when it was set in motion and careened through the city before causing structural damage at Utica’s Union Station. The New York, Susquehanna and Western Railway car – which was carrying plastic pellets – was parked near the Burrstone Road bridge off the North-South Arterial. Picente said once released, the train car’s momentum caused it to drive down the tracks, hit a car at the Schuyler Street intersection, and ultimately bump a display steam engine into Union Station. Utica emergency units and engineers will be investigating Wednesday who caused the accident – and how the damage to Union Station will affect its structural integrity. 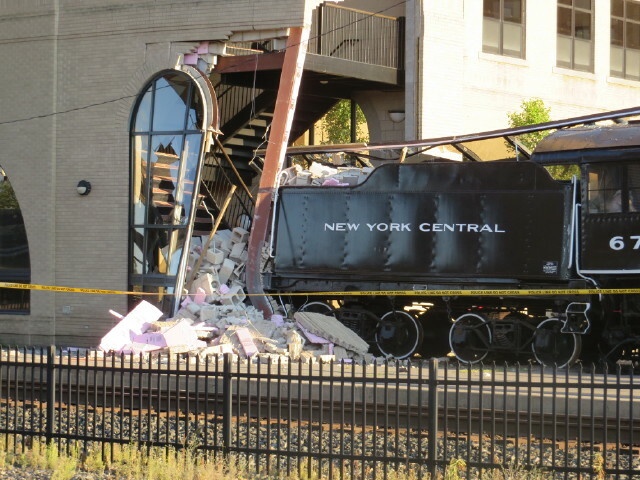 The train struck the tower that supports the station’s pedestrian bridge near the tracks and broke off a large section of the station’s wall. “If we pull the train out of there, the tunnel could collapse,” Picente said. No one was in the stairway or surrounding areas of the crash site when the train collided, but one minor injury was reported on Schuyler Street near Dunkin’ Donuts when the train car struck a Remsen resident’s car. Jake Palmer, 23, said he suffered a cut to his wrist when the rail car crashed into his 1992 Chevrolet Camaro. After the incident, emergency crews walked along the tracks from Union Station toward Schuyler Street to determine if any other damage or injuries may have occurred. None had been reported as of press time. Utica Department of Public Works crews created a makeshift bridge for passengers at Union Station for passengers on incoming trains to use early Tuesday evening. The station didn’t have to cancel any trips, but arrangements were made to handle other trains scheduled to arrive. Melanie Boyer, a spokeswoman for the New York, Susquehanna and Western Railway confirmed the rail car had been traveling on that company’s line, which also connects to CSX lines in the area. She said the incident was “under investigation,” and that the car did not contain any hazardous materials.